School fees and levies are set by the Daramalan College Board. They are an annual charge divided for convenience into four Term payments. Annual fee increases can be expected and usually apply from Term 1. Fees and levies are payable in advance or by instalment during term. The College has to meet regular payment of staff salaries as well as normal running costs. Fee statements show a due date which will be 14 days from the commencement of term. Please contact the Fees Clerk if you would like to negotiate alternative payment arrangements. Many parents find that direct debit arrangements are helpful for budgeting. A reduction in fees and levies is granted where more than one child of a family is attending the school. For two children: 20% reduction on fees and 20% reduction on levies is granted on the older child. For three children: 20% reduction on fees and 20% reduction on levies is granted on the second child, 50% reduction on fees and 30% reduction on levies is granted on the eldest child. For four children: 20% reduction on fees and 20% reduction on levies is granted on the second child, 50% reduction on fees and 30% reduction on levies is granted on the third child; no fees and 50% reduction on levies for the eldest child. Fees and levies in the High School are charged on a yearly basis and payable each term. If a student qualifies for a Year 10 Certificate then the full Year 10 fees are payable even if the student chooses to leave early, for example to take up an apprenticeship. Fees and levies in the Senior College are charged on a yearly basis and payable each term. If a student qualifies for a ACT Senior Secondary Certificate then Year 12 fees for the four terms are payable, even if the student leaves school early at any time prior to the end of the school year. Textbooks are provided to students with the cost being included in the levy. The books, however, remain the property of the school and if lost or damaged must be replaced. The replacement cost of lost or damaged books will be invoiced. Overdue books will be charged an additional per book rate per week until returned or paid for. The College collates and sells Stationery Packs as required by each student for each year. Parents of students who are not entitled to either a Year 10 or ACT Senior Secondary Certificate are expected to give one month’s notice in writing to the Principal if they intend to withdraw students from the school, otherwise a full term’s fees will be charged. Payable on formal acceptance of an offer of a place. The levy covers such things as subject fees, textbook hire, school magazine, printing and minor excursions. The levy does not include excursions costing more than $12.00, sports registration fees or private music lessons where an external tutor teaches a particular instrument. There is a compulsory Year 9 Camp Levy of $400. All such payments will be collected separately and paid directly to the College Cashier. A $25.00 Parents and Friends Levy is charged to each family per Term. This is a compulsory charge as part of the College’s fee structure. Funds raised from this charge are provided to the Parents and Friends Committee, who in turn purchase items for the College. No other functions or fundraisers are held by the P & F.
An optional tax deductible donation to the Building Fund appears on the fee invoice. This is a necessary part of the overall revenue required for the development of the College. The Building Fund donation is $190 per family per term. Fees and levies unpaid as at the due date are subject to an administration fee of $15.00 (including GST) will be debited to all family accounts not paid before the due date (which is usually 14 days after the beginning of each term). A further administrative fee of $15 will be made each fortnight until the account is paid. If the College agrees to a progress payment towards the term’s fees and those fees are being paid by direct debit, this charge will not apply. The administration fee is to defray the additional costs incurred through late payment. 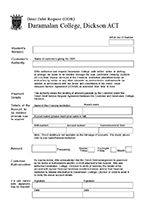 If the Parent defaults in payment of any invoice when due, the parent shall indemnify Daramalan College from and against all Daramalan College’s costs and disbursements including without limitation legal fees on a solicitor and own client or indemnity basis, whichever is higher, and in addition all of Daramalan College’s nominees costs of collection. The parent agrees for Daramalan College to obtain from a credit-reporting agency a credit report containing personal credit information about the parent in relation to credit provided by Daramalan College. to assess the credit worthiness of the parent. The parent consents to Daramalan College being given a consumer credit report to collect overdue payment on commercial credit (Section 18K(1)(h) Privacy Act 1988). processing of any payment instructions, direct debit facilities and/or the collection of amounts outstanding in the parents account in relation to the Goods and/or Services. allow the credit reporting agency to create or maintain a credit information file containing information about the parent.